The episode is divided into two parts. Part one tells of how Tomoe became Mikage’s familiar. 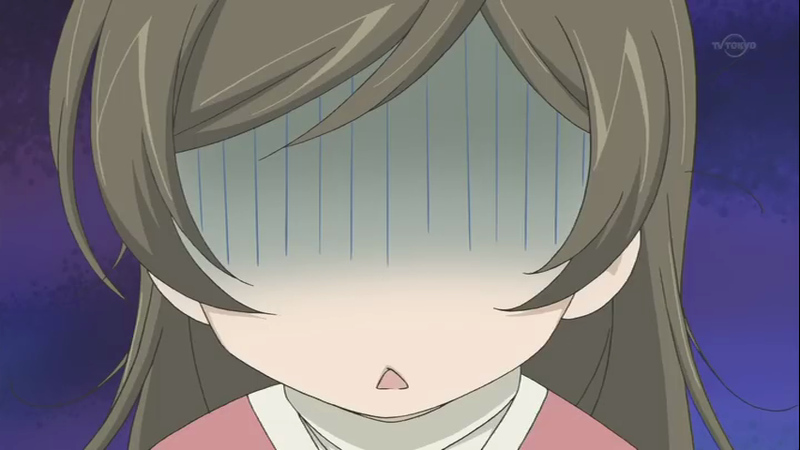 When Yukiji died, Mikage saw a death shadow on Tomoe’s face one day when he was walking. He invited him to his home to be a familiar and trained him for many years. He hated humans then because they were weak. Part two tells of how Nanami went to a goukon (group date; I dunno why it’s called a mixer here when literal translation means group date). 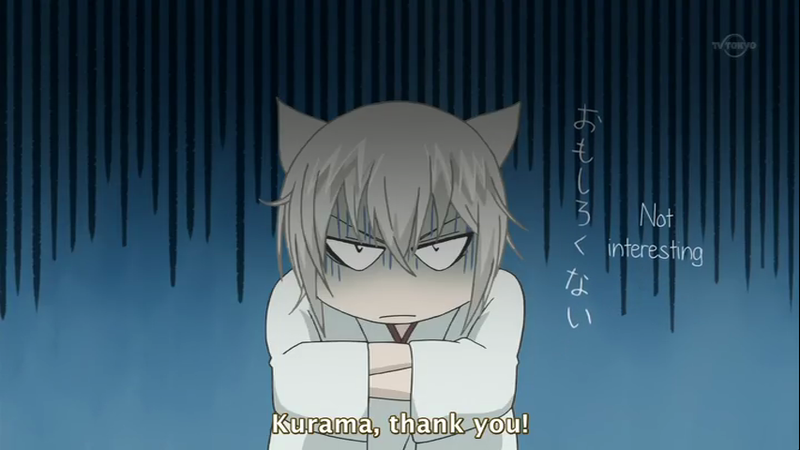 Tomoe, Mizuki and even Kurama follows her. I like the second part of the episode over the first one. The first episode was kind of predictable as Mikage is a very nice deity so I expected him to take pity to Tomoe’s loss. 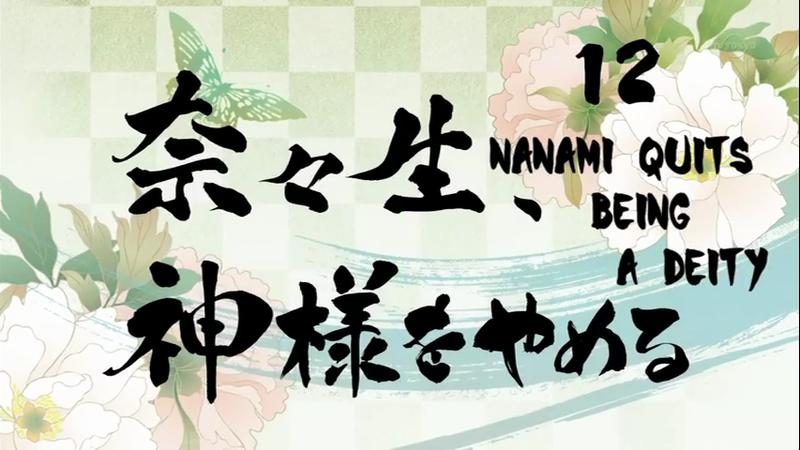 I liked the second part because it showed that Tomoe might actually have feelings for Nanami too! Kyaaa! Also, the three guys (Tomoe, Kurama and Mizuki) went on a group gathering to spy on Nanami. Somehow, my fujoshi fantasies are becoming fulfilled. I like boy interaction! Mizuki and Nanami travel to the past to take the Dragon King’s Eye that Tomoe took. 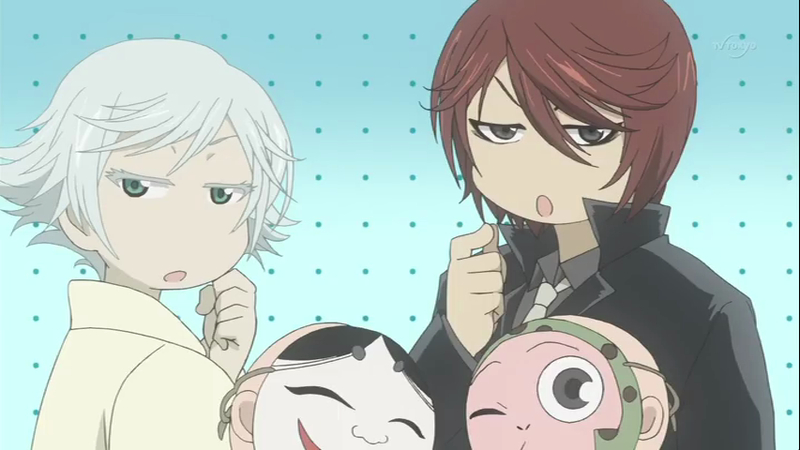 However, Nanami finds out that Tomoe stole it in order to feed it to the sick Yukiji. At this point, I think Yukiji is Tomoe’s girlfriend. They return to the present and Nanami looks for Isohime, a witch she met in the past who said she has a dragon king’s eye. Isohime bargains for thirty years of Nanami’s life, but she tries to cheat her. Mizuki, unable to watch, kisses Nanami and pledges to be her familiar. They go to the dragon king after tormenting Isohime (actually it’s just Mizuki who tormented her) who took nothing from Nanami. They ride and meet the Dragon King’s wife (they didn’t know she was the wife) and Nanami becomes inspired of her unconditional love for husband. They save Tomoe then. And oh, Nanami confesses her love again. OMG! Mizuki is an M! This is the best anime ever! An S and M character in one anime! I am so enamored by Nanami’s kindness although I think she’s an idiot. There are lots of LOLs in this episode and there are also a lot of serious moments. I don’t know what’s going to happen in the next episode, but so far, this is my favorite episode! Nanami and two familiars (S and M). gyaaaa!!! Mizuki is an M!